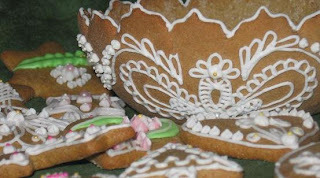 A friend of mine asked me, to also post in English my best recipes. Well, as a gastro-blogger, I'm obviously convinced, that all my recipes are among the best ones :-). 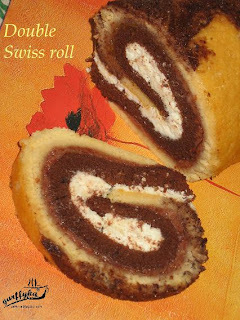 I think that this double-Swiss roll merites an English post. To do the white sponge cake: the whole eggs, the sugar, the grated lemon peel and vanilla essence mix with hand mixer, continuously for 20 minutes. Raise the speed of your hand mixer approx each 4th minute. Mix the yeast to the flour and sift spoon by spoon to the egg-sugar, mixing the cake well with each spoon of flour. Turn oven heat to 200 degrees. Put a piece of baking paper in a big baking dish, pour the cake into and smooth it. Put the cocoa powder in a small sift and gently sift it accross the cake. With a fork work the powder in the white cake. In result the cocoa and white cake will result marbly figure. Put the cake in the oven and bake it for 5 minutes on 200 degrees, and further 8-10 minutes on 175 degrees. 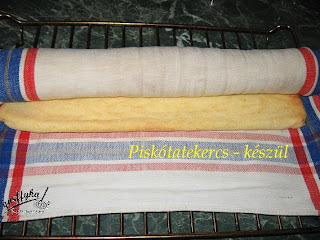 Take a clean and dry dish-cloth and lay it on a baking screen. Strew the dish-cloth with sugar. When the sponge-cake is ready, take the baking dish from the oven, carefully pick two corners of the baking paper and turn the cake on the sugared dish-cloth. Peel the baking paper from the cake's back (if necessary, strew some cold water on the paper, so can be peeled easier). 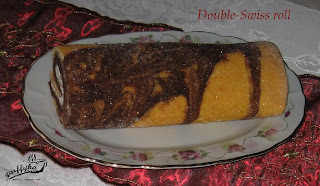 Take the dish-cloth from its longest side and roll it with the sponge cake. Roll it out, and roll again from the other (longer) side. Roll out again and, for the last time, roll the cake from the first direction. Leave the roll on the screen to cold. While the white sponge cake is cooling, mix the cocoa-chocolate cake. Do it step by step as with the white cake, that's, mix the sugar and eggs for 20 minutes, raising the speed of your hand mixer periodically. Add the cocoa powder to the flour and yeast and sift the mixture spoon by spoon to the egg-sugar, also grate the bitter chocolate in the cake. Bake it as the white sponge cake, of course, using a new baking paper. 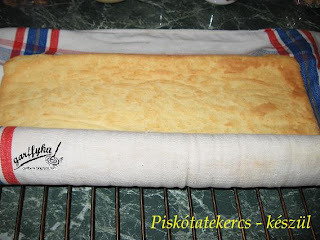 When baked, turn on a clean and dry dish-cloth and roll it three times, just as with the white one. Leave it to cold. Put the marzipan in the freezer, this will help to grate it later. Whip the cream till turns hard. Mix the curd alone than add the whipped cream to it and mix it gently. Roll out the white sponge cake, put with the sugared slide on a big enough chopping board (or on the clean kitchen desk), smear it with the strewberry jam and grate the marzipan on top. Roll out the cocoa-chocolate sponge cake and carefully place it on top, leaving some half cm space from the longest side of the white cake. Spread the curd-whipped cream mixture on the black cake. 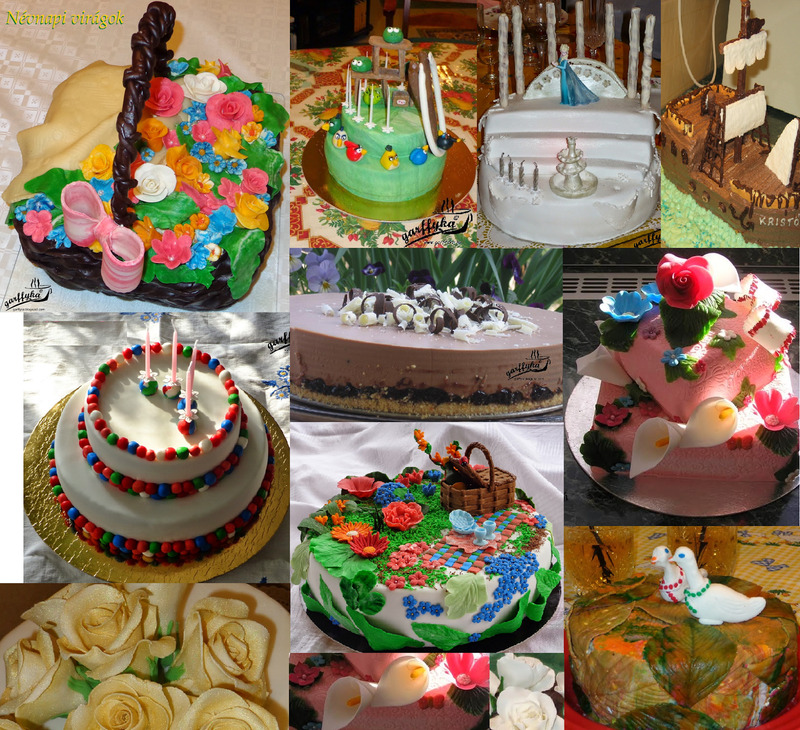 Take the cakes from the longest side and carefully roll it up. The cocoa-chocholate slide will shift a bit, but keep rolling. When done, chop the extra part of the dark sponge, which reaches out from the roll. This might be parted in two and put in small rolls. 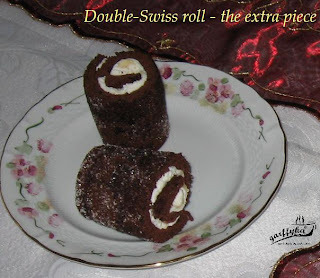 Pick the double-Swiss roll carefully from the chopping board (or kitchen desk) and place it on a tray.